In September 2018 we found ourselves back in front of the camera when our friends at The Gate Films contacted us with regard to an exciting new project. We had worked with The Gate previously on a commercial for online gaming company 118 Bet back in 2016 so were delighted when we were their first point of call for their new project. This time for a glamorous Christmas commercial for Look Fantastic on behalf of The Hut Group. Look Fantastic are Europe’s No: 1 beauty retailer and had a very showbiz theme for their 2018 campaign – ‘Take Centre Stage’ – right up our street! Being no strangers to television work we were excited to provide 7 showgirls, our fabulous aerial silk artiste and 3 other featured artistes for the commercial. The BIGGEST event of the year was without doubt the arrival our company directors beautiful baby daughter, Isabelle Ivy back in July. Although still a bit small for sequins and feathers we are sure it will only be a matter of time before we have a new showgirl in the making! And congratulations to Emma-Jane and husband Richard on the new addition to their family. Right up until Isabelle Ivy’s arrival things were as busy as ever in showgirl world. Something that had dominated the press and industry in 2018 was the #metoo movement. Stemming from the Harvey Weinstein scandal this then seemingly spilled over into the arts and entertainment industry back in January 2018. 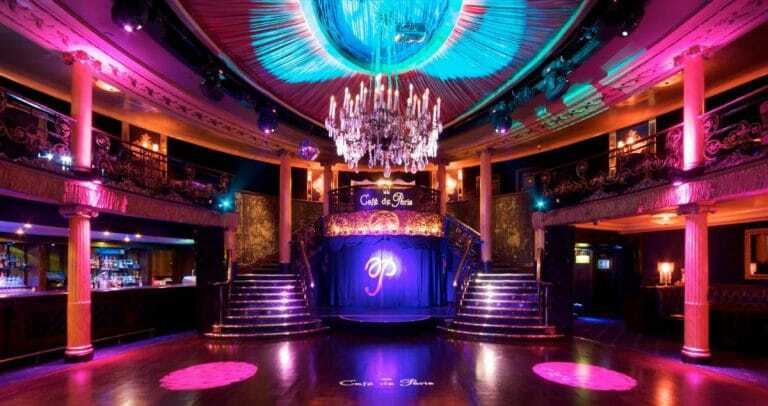 The much publicised Dorchester scandal saw a reporter from the Financial Times go undercover as a hostess at the annual charity event at one of London’s top hotels. Upon publishing her findings, things spiralled out of control very quickly within our industry. We saw the banning of Formula One grid girls and darts walk on girls. These jobs and roles were suddenly seen as ‘inappropriate’ and ‘sexist’ – jobs which had been part of the sporting industry for many years. Why this sudden turnaround? Christmas has been and gone and it’s the start of a brand new sparkly year. Our feathers have been washed and hung out to dry and we are gearing up for yet another busy year ahead……. December was the usual busy and hectic month for The Vegas Show Girls with Christmas parties, tinsel and sequins coming out of our ears (literally!). 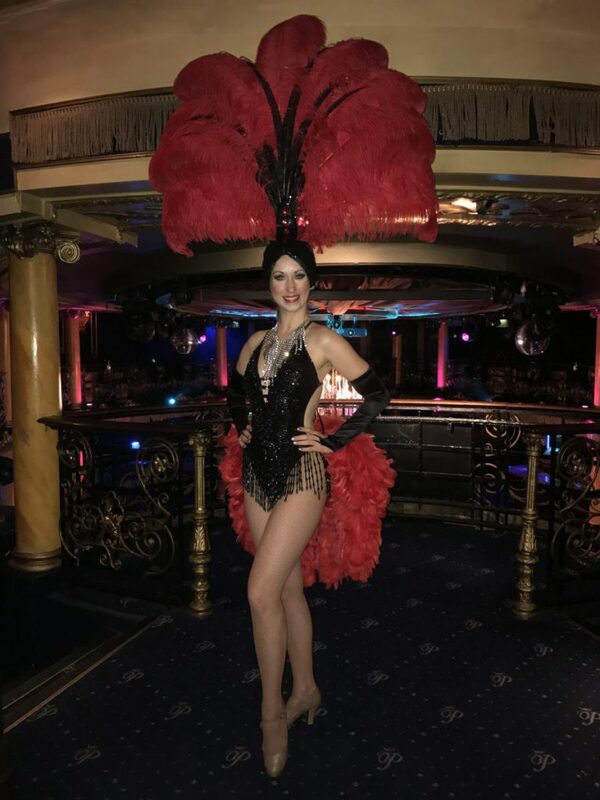 Our stunning Show Girls and dancers performed at over 40 events during December covering many of our themes from the Roaring 20’s to Moulin Rouge and Masquerade. We brought in the New Year in style at eight different venues throughout the country from London through to Leicester – what better way to see in 2018 than with feathers and glitter?! New Years Even themes included a ‘Sin in the City’ Las Vegas themed event, A ‘Gold’ themed Party and A ‘Glitter Ball’ party – how glamorous! Our elegant Ballroom dancers also brought in the New Year in true Strictly style gliding across the dance floor at a ‘Hollywood Glamour’ themed party at The Swan in High Wycombe. But before we got to the crazy month this was December The Vegas Show Girls had the privilege of being invited back for the 3rd consecutive year to be part of the official entertainment line up for the Royal Variety Performance After Show Party at London’s prestigious Grosvenor House Hotel……..
As the winter nights drawn in, our summer season in the Las Vegas of the North seems like a distant memory….. 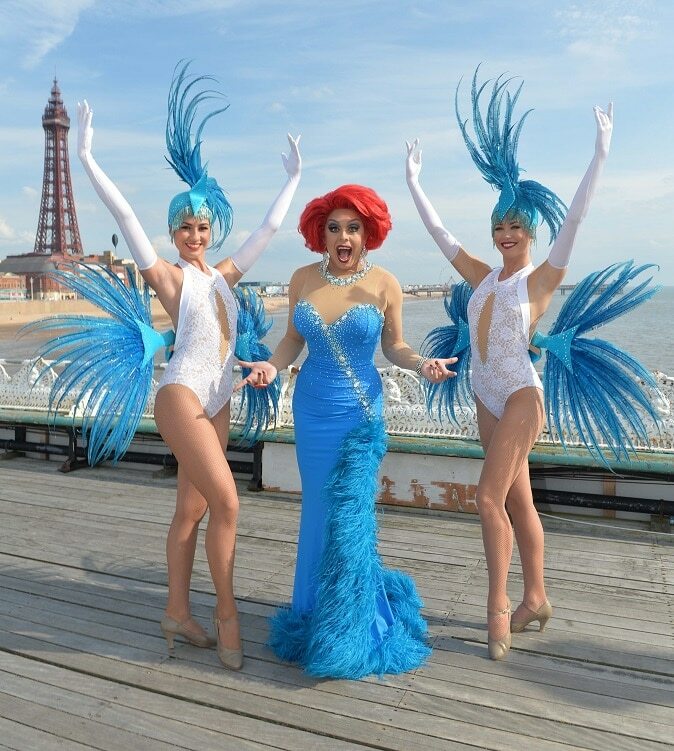 But we didn’t want to let the smell of candy floss and fish and chips disappear just yet without telling you all about our glamorous summer shows at Blackpool’s North Pier Theatre this year starring the fabulous Britain’s Got Talent, Ab Fab movie, singing and comedy superstar – La Voix. It most definitely was a ‘Ten from Len’ when our fabulous Vegas Show Girls joined the former Strictly star on set for 3 days of filming for the new Farm Foods television commercial. Filming took place over a very windy three days in June in Cardiff. If you watch the last scene of the advert very carefully you will see the large trees blowing around in gale force winds – not the ideal weather for showgirl feathers! 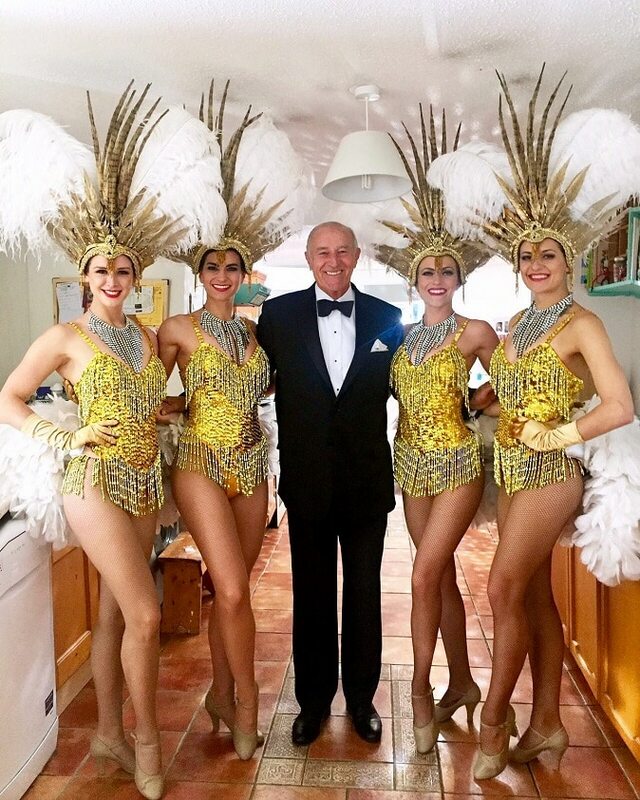 Wind aside our Vegas Show Girls and former Strictly Come Dancing judge, Len Goodman got on with the job in hand creating the tongue in cheek advert which gives more than a nod to the BBC’s Strictly Come Dancing – glitter balls, showgirls and all! The latest Farm Foods advert featuring Len Goodman and The Vegas Show Girls is now showing on ITV. We were thrilled to be asked back for the 6th consecutive year to perform at this annual event which is a firm favourite on the events calendar at Prescott Speed Hill Climb, home of the Bugatti Owners Club. La Vie En Bleu incorporating Vita Rossa is Prescott Hill Climbs French and Italian motoring festival. A celebration of French and Italian cars, music and entertainment which includes an eclectic mix of motor cars spanning the last 100 years plus visiting car clubs, musicians, trade stalls, dancers and actors to keep the whole family entertained. We had a slightly different brief for our Ultimate Vegas Package last week – to take it to Church! Well, a converted Church which is now a fabulous events and live music in Leeds. What a great and unique venue for a Las Vegas Themed Event! The guests were met on arrival by our fabulous fire performers who did a grand job of warming up what was a slightly damp night in West Yorkshire. But it certainly did not dampen anyone’s spirits…. 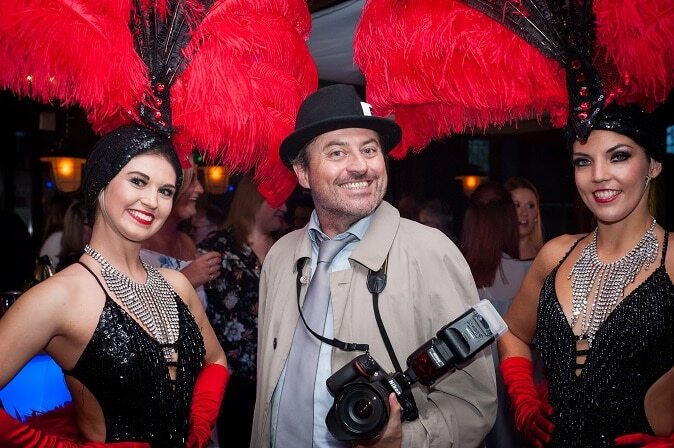 With our interactive paparazzi photographs on hand to capture the guests upon arrival and the fabulous entertainment throughout the evening almost everyone managed a smile! Guests were also greeted with a much welcomed glass of prosecco served by our very handsome Vegas Show Boys and glamorous Vegas Show Girls. 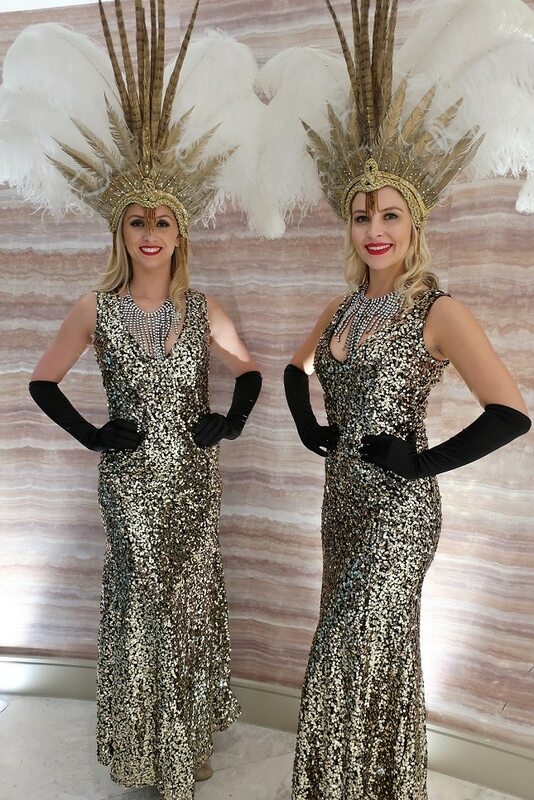 The Vegas Show Girls and Boys were part of a huge line up of lavish Las Vegas themed entertainment for IT Services company SCC supplied by Scarlet Entertainment. From celebrity look a likes including Angelina Jolie, Brad Pitt, Elvis Presley and Will Smith (who are often spotted in Solihull on a Friday evening!) to fun casino tables, fake paparazzi, vintage circus performers and a stunning mirror ball hand balance act, this event really did have all the glitz and glamour you could expect from a Las Vegas extravaganza.